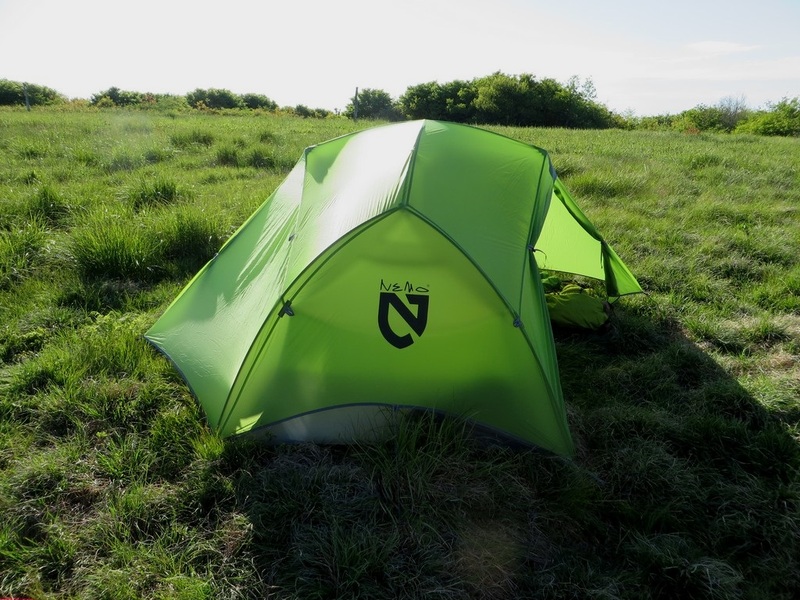 The Dagger 2P from Nemo is aimed directly at the lightweight, but roomy backpacking tent market. Aggressive material selection and light modification to a tried and true pole design produces a large, spacious tent for under 4 pounds. But how does it perform? The Dagger weighs in at a trail weight of 3 lb 12 oz (tent, body, stakes, line, and stuff sacks). The floor dimensions are a larger than usual 90” x 50”, with an internal height of 42″. A single, connected pole system with a wide cross bar lifts the tent and widens out the walls. The tent consists of two doors that stake out in two points instead of one. This creates more gear storage, and more options for entry and exit configurations. The fly is a breezy 15D Nylon. The floor is a thicker 30D nylon ripstop (3000mm). The poles are 9.6 mm DAC featherlight NSL. Also included are two guy out lines, and eight tent stakes. The entire package retails for $399.95. The dagger is supremely livable. Wide open interiors, thanks to an abnormally large cross bar and clever pole arrangement provides ample room to sit up straight, work, and play. I never once found myself wishing I had just a little more room, and I never had to elbow joust to get to what I needed. The vestibules are also quite large, and arranged in a way that allows you place gear on each side, and move in and out straight through the middle, eliminating the need to climb over equipment. They also provide good protection from the sun, wind and light rain even when the center section is left open. 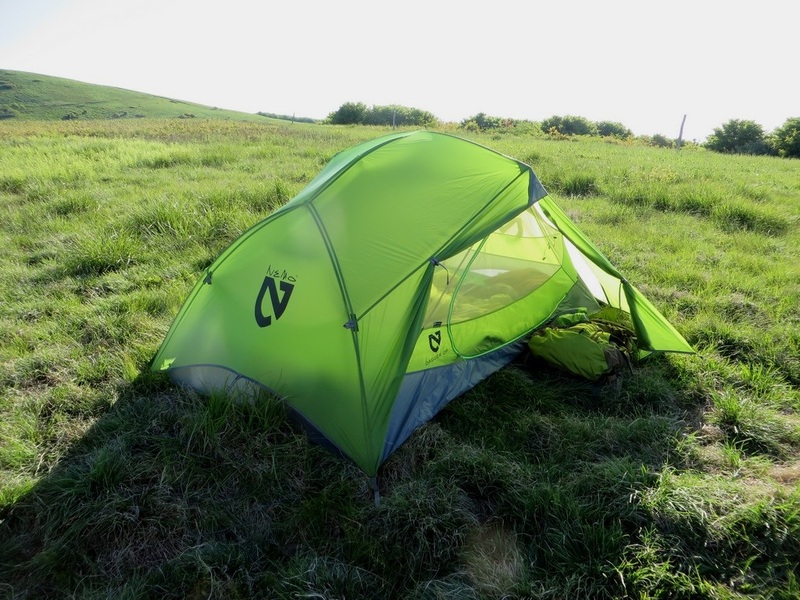 For the impressive amount of room you’re getting, the tent is quite light weight at just 3 lb 12 oz. It packs up pretty small as well. It’s more spacious than other tents in the weight class. Stability is better than expected, largely due to the dual stake out points on the vestibule and rigid frame. 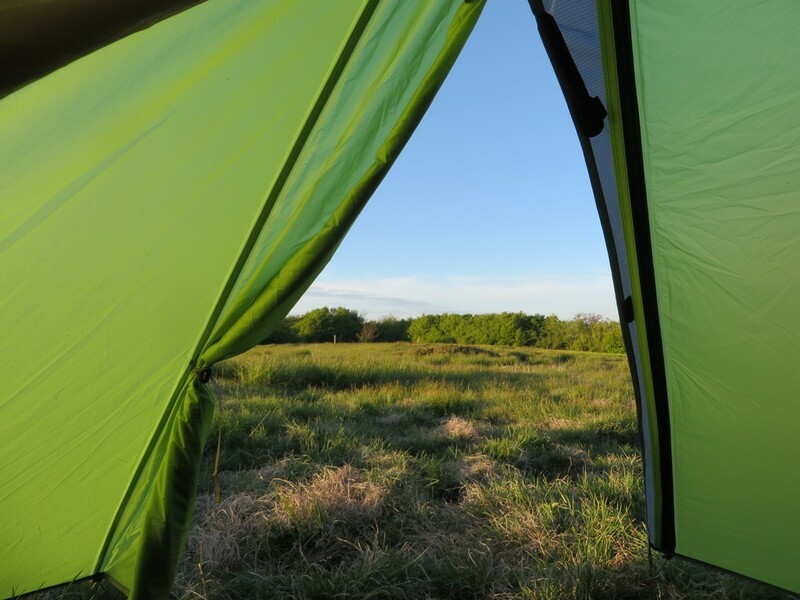 Even without guying out the tent, the tent held in place with minimal movement and noise even on exposed peaks with generous winds (10-15 mph). 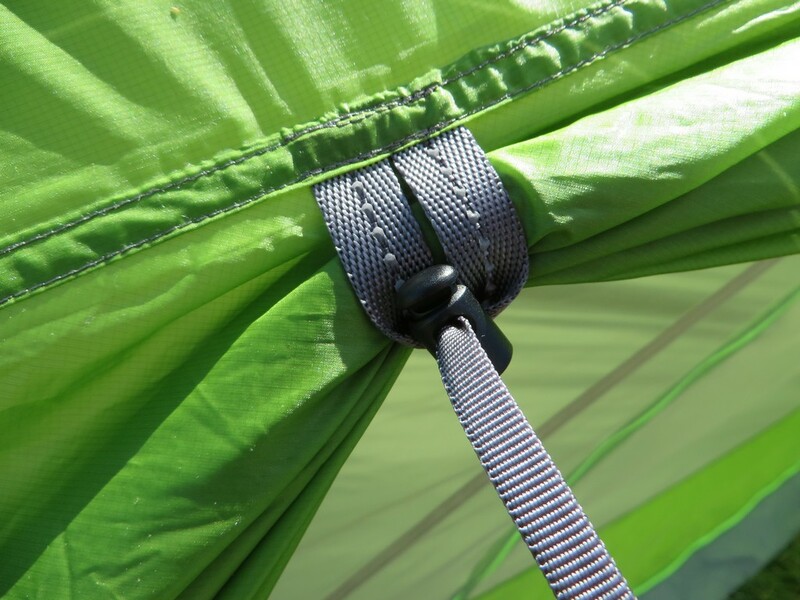 A series of tensioners spaced about the corners of the tent and even on the vestibules allows a tight pitch in any condition. Set up is as simple as it gets. Easy to use clips and stakes allow me to pitch the tent is minutes even in foul weather. Clever vents are built into the doors, allowing you to prop open a small gap at the top zipper. It’s light weight and works pretty well even in the rain. The tent doesn’t come with enough stakes to guy out the tent. Only the base number is included (eight stakes). That’s plenty for most cases, but I’m a fan of battening down my shelter. There are a couple extra lines included, but they’re thick and you have nothing to stake them down with. While the tent is fairly stable without them, I always recommend adding additional stakes (six in this situation) and guy lines to improve not only the stability but the ventilation as it pulls the fly away from the tent at the head foot. This of course adds weight to the packed weight, although a few light weight stakes will do a fine job. Condensation can be an issue at the head and foot in extreme cases (camping in the clouds for example). These sections are essentially single wall as the fly cuts back and away from the body. This caused condensation build up on the inner wall and the damping of my sleeping bag at the head and feet on some tests. Aside from an overall breezy design, there are no top vents aside from the built-in door vents to aid in preventing this, although the door vents certainly help. Overall condensation was still managed pretty well. For more information, check out Nemoequipment.com. For details on how we do our ratings, check our About Us page. If you have any questions, feel free to comment below or send me an email. We’d love to hear from you! As always, thank you so much for reading. We’re also on Facebook and Twitter. Links on the side of the page. How’s the width, good for 2 people comfortably? How does it work for multi-day trips, is it easy to set-up and tear down quickly? I’m strongly considering this tent since it’s super light compared to what I have now. It also seems to be quite strong in order to fight off some nasty storms. It’s actually very roomy and livable. Being inside with two is quite enjoyable. It’s also painless and fast to set up. As light as it is, it won’t perform in a storm as well as some, but it gets the job done. I was seriously considering the Big Agnes Copper Spur UL2 until I came across the NEMO Dagger 2P, Im unsure about the durability of the Copper Spur, but it sounds like it’s more breathable than the NEMO. What do you like between the two? Hi there. The copper spur is surprisingly durable, and it does have excellent breathability. Both are great tents, but I’m a fan of the spur. Although the Nemo is a good deal roomier. Hello, I am also hesitating and I am going to test the Copper Spur HV UL. That’s an excellent question. Sleeping space is pretty comparable. The only real difference you’ll really notice is sitting up space the the HV has a bit more should room. If you’re just sleeping inside, I wouldn’t let the size difference be a huge determining factor. If you are sitting up and spending lots of time inside, maybe consider the HV a little harder. Strongly considering this tent, but wondering how you think it would handle the cooler end of the three season spectrum. I know in some windy conditions, high cut flys or ones that leave quite a bit of room at the bottom along with a mostly mesh upper can become a wind tunnel of sorts. Notice any issues with the warmth of this tent? Thanks! I think this tent would do just fine for colder weather. I’ve camped with it at fairly high altitudes in windy conditions, and I found that the high nylon walls on the inner tent did an excellent job of both blocking wind and preserving some internal warmth. I don’t think you’ll have any problems at anything above 10 or 15 degrees if you have a good sleeping bag. I’m happy to be of help. I’m sure you’ll love the tent. It’s an exceptional piece of equipment. I am wondering how tall you are. 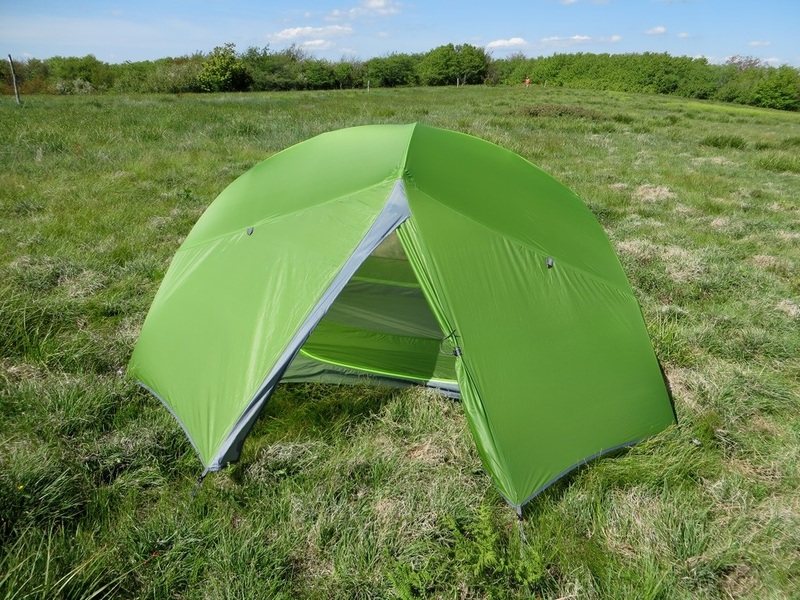 I am considering this tent as well as the Copper Spur UL2. I like the Hubba Hubba but it is the shortest of the three. The Spur is 90 inches long by the way BA measures it (from the outside where the webbing meets the tent corner) but the inside is at least 4 inches shorter. I don’t think I could go shorter than the Spur. I’m 5’8″, and the lady is 5’10”, we both happily fit inside with no issues with length. Depending on if you’re taller, you might start to run into a slight shortage on space. How tall are you? Thanks for the reply. I am a hair under 6 feet. You state that your bag got damp at both ends, so I am wondering about the actual interior floor space. My quilt is 84 inches, but ends up a bit shorter when the foot box is closed and the rest is tucked around me. You should be just fine at that length, most of the time. My issues came up when I was on an incline, slowly sliding to the bottom of the tent, and climbing back up. Still, most users don’t stay in one spot, so this could come up in your situation also. It’s not an issue if you’re in a drier climate though. Hey Inga! It’s awesome to hear back from you. I’m super happy that you’re enjoying the tent! It really is a great design, and it provides an insane amount of room for the weight. We get an insane amount of condensation here, so I’m glad that it’s working out in your environment. Quilts are tricky, but I’ve honestly never found one I hadn’t liked, so I wouldn’t stress out too much. Happy trails, and thanks again for reading! Thank you, for doing a review on this tent, as I have looked all over for someone to have reviewed the tent before I bought it. I did buy the tent last year toward the end of the season, after I went down to my local REI, and saw both the Hornet 2P and Dagger 2P. Was sold when I felt the weight, and saw the interior size of the tent, along with the size of the vestibules. Looking forward to using it all summer long…in the PNW. Thanks, again…! I’m so happy that I was able to help out. This really is an amazing tent. The space to weight ratio is off the charts. I’m glad your’e enjoying it. I’m hoping to get some more Nemo equipment up this summer. We’ll see how it goes! Congrats on having an excellent tent. A short and Sweet review! thankyou! I have been looking at this Nemo Dagger 3P vs the Big Agnes copper Spur UL 3P and saw quite a few reviews saying that the mesh material on the Big Agnes is very very delicate which worries me. How would you rate the Mesh material on the Dagger??? I have about 4 years of experience with the Copper Spur 2, and I haven’t had any issues with the mesh (or with any BA tents that use it). It is an ultralight material, and snagging it on a stick or branch could result in a tear, but it’s same situation with the Dagger (I believe the Dagger actually has thinner mesh). Durability with UL tents is more about the user than the material in the end. The trick is to be careful with the placement, keeping the doors off the ground, away from branches and such. If you do that, normal use isn’t going to damage it at all. I would say the Copper Spur is actually the tougher tent between the two, by a small margin. The Nemo is going to be roomier, so what you choose should be based on your priorities as a camper. I’ve not had any issues with durability with either tent in the end, but my trust would fall towards the CS. I hope this helps, but let me know if I’ve raised more questions! Thanks again for your advice! I actually pulled the trigger on a dagger before i saw your email now i m having 2nd thoughts so i canned the order. I saw on a few review that even the stuff sack the Big Agnes comes in got ripped up by some thorny bushes, while i believe the Dagger comes in a very nice tuck away bag with slots for all the separate part is that right? Hi again! I’m happy to see you’re doing your research! It’s a big purchase. Yeah, I’ve witnessed many tents get shredded via the stuff sack, but it’s usually people who are carrying them on the outside of their packs inside the stuff sacks, which I never recommend. Any tent would suffer from a snagging branch or thorn, especially with the weight and momentum of a human hiker behind. It does come with a nice stuff sack that keeps things organized, but in my experience the tent packs up smaller without it (stuffing it into a pack). Although it’s nice for long term storage. The Copper Spur doors drop down onto the ground with their “n” shaped doors. They usually fall inside the tent, which is good. 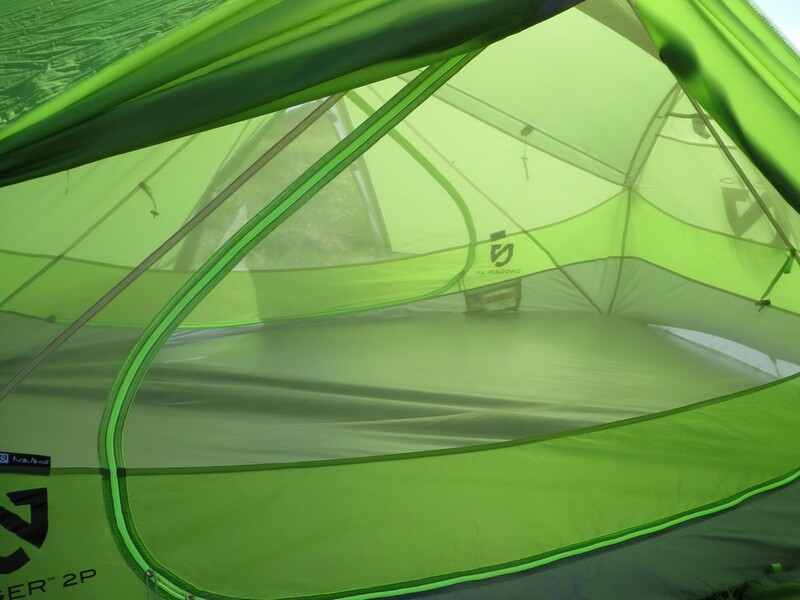 They’re designed to open up the entire side of the tent for easy entry and can be toggled down. The dagger doors mostly stay off of the ground thanks to their “D” shape, which helps alleviate the problem. As far as the Jake’s foot attachment points, that’s really just personal preference. They both work great and I’ve never had any issues with either one. The Jakes foot might be every so slightly easier to pop in and out, but they are plastic and could (in theory) break or be lost as they’re not permanently attached. But, they can be replaced which is a nice. Ok i finally pulled the trigger on the CS UL 3 Mtn GLO edition with a free footprint ….not so fitting as this is a review for the NEMO Dagger 😛 I will def come back and let you know how i like it once i take it out with the family for a xmas camping trip. Just looking at your comments above i think i m going to just keep keep my tent in a dry bag inside my pack’s main compartment to mitigate the chance of it getting ripped up by accident. Hi! Thank you for your review.The only concern i have about this tent is the 3000mm hydrostatic head. Is it that not too little? That’s an excellent question. In my experience, it’s been far less about the thickness of the head, and far more about the quality of the coating, and especially the quality of the fabric underneath it. I’ve had absolutely no issues with low hydrostatic heads from Nemo, Big Agnes, or Sierra Designs. Keep in mind, the penetrate a 3000mm hydrostatic head, a tube of water roughly 10 feet tall had to press against it to leak (3 meters). That’s an incredible amount of pressure, and really doesn’t reflect anything you’ll see in the backcountry (rain from the sky pushes at a pressure of around a 2000mm column). Instead, it’s more about how durable that coating is, and a huge part to do with that is how consistent the fabric it’s attached to is. Just like paint won’t stay on a janky surface, a DWR won’t stick to inconsistent fabric. Nemo uses some of the best. I wouldn’t worry about it one bit. If rain is @ 2000mm, why does everyone use a 1500mm fly? I am so torn, on this to the Cooper. I have a Sierra Design Lightning FL and the bathtub is supposed to be 3000mm, but last year in on the Teton Crest Trail, the last day we were caught in a massive storm that hailed and then down-poured all night (It was supposed to be snow). We were stuck and actually had rain water flowing under our tents (we had 6 tents set). In the morning the 2 Lightning FL’s, water was penetrating the floor. An additional design flaw allowed back splash as well; my down bag was soaked. I always use my down bags in late fall trips and am not interested in sleeping in another wet tent. Which tent would keep us the driest, while providing ample vestibule space for multiple 65L packs and shoes? Honestly, if it wasn’t for the weight, I would be going for a 4 season tent. That’s an excellent question, and it does make you question the testing methology of the fabrics. However, I have a feeling it’s something to do with the fact that rain isn’t a constant pressure, but a water column is. I’m just guessing, but maybe. That’s surprising with the Lightning FL, as I consider it one of the better built tents out there. Any chance it could have just been condensation building up on the floor (those conditions would be ideal with the cold water beneath and the warm air inside the tent). Hello, Like a lot of the people here I am also considering the Copper spur, MSR Hubba Hubba and the Nemo Dagger…all in 2 person tents. My main concern is the weather resistance that you mentioned in your articles. Was the condensation bad for your sleeping bag? when you touched the fabric during the rainstorm, did all the water get absorbed through the tent? I am looking for at base and “in the clouds”. Thank you and thanks for your detailed articles! Very helpful! Condensation is always an issue, with any tent, when you’re camping in the clouds. With the Dagger, you will get wet at the head and feet in these conditions. I wouldn’t necessarily say it was bad for my sleeping bags, as they dry pretty quickly (especially if you’re using dridown), but if your’e at it for a few days on end, it could potentially build up if you keep packing it away wet. The single walled sections at the very bottom will be wet on both sides, immediately accessible to your sleeping bag. There really is no avoiding it in this situation, unless you’re 4′ tall. It’s not a deal breaker, but certainly something worth considering. Less of an issue if you’re a weekend warrior primarily. Thanks for the thorough review. After having just spent 3 days on Lake Superior Park’s rugged Coastal Trail with a 7lb Marmot tent we just ordered the Dagger 2P from Campsaver along with a JetBoil MiniMo stove. Looking forward to going back on the trail with lighter gear in a few weeks. I’m yet to make it to Superior. I hope you had a great trip. I’m quite excited for you. The massive cut in weight you’re going to save is certainly going to make your journeys a bit more enjoyable in the future. Congrats on the new purchase, and I’m happy that I could help! CampSavers’s circa 1995 web site didn’t clearly show that the Dagger was out of stock for 1-4 months until the day after I ordered it. Same for the JetBoil and the Osprey Exos 58 for my wife. It may have been fortuitous because we got concerned about the condensation issues with the Dagger 2 and your favorably reviewed Sierra Design Lightning FL. So, we ordered a SD Flash 2 FL and the other gear from Amazon/Backcountry Edge. While it’s a bit heavier I’m hoping it will be drier and have more room for the two of us and our 50lb dog. We will still shave a lot of weight/volume from our current Marmot Limelight 3, heavier packs and Primus canister stove kit. Ah, nothing worse than ordering back-ordered gear. They’re both great tents, but I think you made a good call. It’s still one of my favorite tents and the durability is far better than most. Enjoy the much lighter pack! That’s actually at the top of my bucket list! When’s the best time to do it? Avoiding the crowds is always a priority for me. Per Squirrel’s experience with the Sierra Designs tent, it wasn’t stated if a ground cloth was being used. I’ve on old Tarptent Cloudburst. Second trip was paddle/camping the Smokies on Fontana Lake. Mid-Oct cold front came in, stalled out forming a train of thunderstorms non-stop along the same track for about 10-12 hours of truly pounding rain and hail. Silnylon, even with 3000 head coating, can push water through pressure points while sitting on fully saturated soil. I used a sheet of plastic meant for a bivi setup as a ground cloth, though it was only slightly larger than my NeoAir pad. The floor under my pad stayed dry. However, where my knee was touching the floor (side/belly sleeper) and where the pack was, the floor was wet. So, my lesson was that silnylon, with prolonged exposure to water with consistent pressure will force the floor to wet through. Recent ultra light tents are using even thinner rain coating. If you want true waterproof that will hold up there is no other choice than Cuben fiber (DCM). You’ll pay dearly for the niche product, but it is the ultimate tent fabric. Thanks for giving us some incite as to how it’s performed for you. I’m yet to have any issues, but it’s interesting to see that it’s pushed through on you. Granted, I usually camp up high where full saturation is less likely to happen, so this could be factor. That’s good information to know. I bought the footprint with our new SD Flash 2 FL tent so I am hopeful it will keep us dry on next week’s 5 day backpacking trek on Lake Superior Park’s Coastal Trail. I’ve found the Flash FL materials to be unusually stout when it comes to weather protection. I think you’ll do just fine. Best wishes on your trip. That sounds amazing.